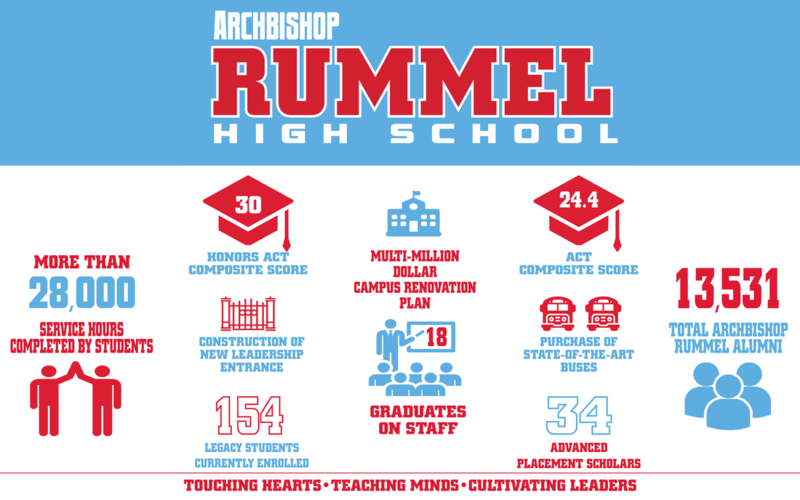 Archbishop Rummel High School has been one of the premier high schools in the Greater New Orleans area since our inaugural class graduated in 1966. Over the next 50 years, 13,000 more students have walked our halls and learned what it means to have Raider Pride! To continue this tradition of spiritual and academic excellence, Archbishop Rummel High School must continue to invest in technology, upgrade our campus and remain academically relevant with quality instructors while being fiscally responsible. The Annual Giving Drive is a fundraising campaign sponsored by Archbishop Rummel High School that allows the school to remain extremely competitive with tuition and fees and still thrive in our mission of educating young Christian gentlemen. -The purchase of 2 new buses. -The construction of the new Leadership Entrance by the Raider Gym. -The initial transformation of the West Campus into a Sports and Pre-Professional Annex. -The investment of technology used to educate our students and train our faculty. During the 2017-2018 school year, Archbishop Rummel plans to direct fundraising monies toward continued professional development, academic and advancement software, improve classroom technology and new Raider Room tables and furniture. Our goal this year is not to exceed last year’s total but to reach a sustained level for the Annual Giving Drive that feels comfortable for each Rummel family year after year. Reminder, all donations are welcomed and appreciated. This year, donations of $1,000.00 or more will receive a gift of appreciation along with other additional Raider rewards. Your donation will help keep our legacy of Raider Pride alive! Thank God Almighty, I’m a RAIDER! Archbishop Rummel High School educates each student according to the principles of the Catholic Church in the Lasallian tradition of faith, community, and service. In a caring, disciplined environment of social awareness and academic excellence, Archbishop Rummel High School challenges each student to recognize the dignity of life and to develop and share, to the best of his ability, his unique talents.